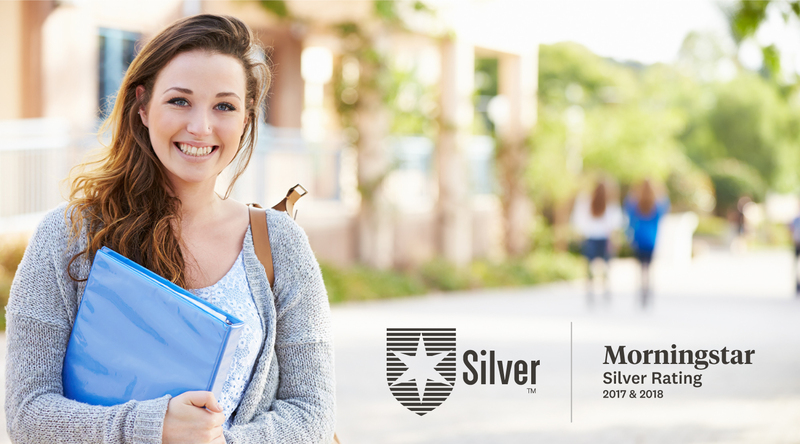 Then in the fall of 2017, that honor was upgraded to a Silver rating, signifying CollegeCounts 529 Fund – Direct Plan was one of the best options for a 529 plan in the country. This past fall, the good news continued as CollegeCounts 529 Fund – Direct Plan was yet again awarded a Silver rating by Morningstar, proving that CollegeCounts is still one of the best 529 plans in the country. In 2018, Morningstar evaluated 62 different 529 plans representing 95% of invested 529 assets. Of the plans that were evaluated, only four plans received a Gold rating and nine plans received a Silver rating. We are proud to have received a Silver rating from Morningstar for the second consecutive year! Process – Did the plan hire an experienced asset allocator to design a thoughtful, well-diversified glide path for the age-based portfolios? What suite of investment options is offered? People – What is Morningstar’s assessment of the underlying money managers’ talent, tenure, and resources? Parent – Are the program manager and investment manager good caretakers of college savers’ capital? Is the state managing the plan professionally? Performance – Have the plan’s options earned their keep with solid, risk-adjusted returns over relevant time periods? Price – Are the investment options a good value? Each pillar is given a positive, neutral, or negative rating. CollegeCounts 529 fared very well in this evaluation once again, scoring the same marks as the previous year: a positive rating in Process, People, and Parent and a neutral rating in Performance and Price. To learn more about Morningstar’s rating system, or to compare CollegeCounts to various other 529 plans, visit Morningstar.com. If you don’t already have a CollegeCounts account, visit CollegeCounts529.com to learn more about Alabama’s Silver-rated program and start saving today. 1 Individuals who file an Alabama state income tax return are eligible to deduct for Alabama state income tax purposes up to $5,000 per tax year ($10,000 for married taxpayers filing jointly if both actually contribute) for total combined contributions to the Plan and other State of Alabama 529 programs. The contributions made to such qualifying plans are deductible on the tax return of the contributing taxpayer for the tax year in which the contributions are made. In the event of a Nonqualified Withdrawal from the Plan, for Alabama state income tax purposes, an amount must be added back to the income of the contributing taxpayer in an amount of the Nonqualified Withdrawal plus ten (10%) percent of such amount withdrawn. Such amount will be added back to the income of the contributing taxpayer in the tax year that the Nonqualified Withdrawal was distributed. Please consult with your tax professional.